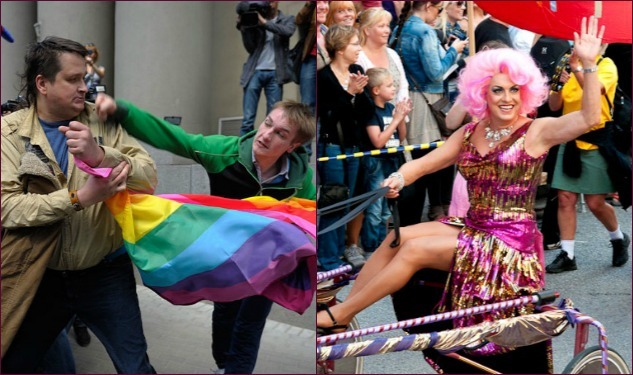 Swedish activists hope to turn their pride against Russian hate. Moscow city officials this week upheld their city's 100 ban on pride parades. This means that yet again Russian LGBT activists and their allies will have to make alternative plans, and Stockholm Pride's hoping their new #GoWest campaign will encourages Russians to spend their gay pride in Sweden, instead. "To celebrate that love, regardless of gender, sexual orientation, ethnicity and gender identity is a democratic right, we have taken this opportunity to, with humor and love, direct a special invitation to all of Russia to celebrate Pride with us," Stockholm Pride said. Whether you can make it or not, supporters are urged to hit up the Go West 2013 website, where they can compose a tweet-invite that will be translated into Russian and spread throughout the country. In the end, Stockholm Pride hopes to generate enough Twitter interest to help spark worldwide protests against Russia's anti-gay campaigns. Because, you know, the United Nations can use all the help they can get.